c betting: activities where a participant has a chance to win a prize, and where bets are taken on the outcome of a future event or the occurrence of a future event. A lottery that is divided into several classes, with separate prize draws for each class. Bets where all or part of the prize depends on the size of the total pool of bets or is split between the winners. Mechanical or electronic machines that can be used for games where the player can win a prize. Games concluded between a player and a gambling operator using remote communications. Games concluded between a player and a gambling operator or a gambling operator’s dealer who meet in person. Contrary to most gambling regulations, Danish gambling legislation does not distinguish between online poker and other online casino games. Poker is considered a casino game and is not subject to specific regulations, and is consequently regulated under the same rules as any other online casino game. Fantasy league games are considered and regulated as pool betting and require a licence to be offered. This allows an operator to offer daily fantasy leagues as well as the more traditional season fantasy leagues. Spread betting is considered a financial product and cannot be offered under a betting licence. The offering of spread betting is restricted to registered financial companies and is regulated under the Danish Financial Services Act LBK No. 182, 18 February 2015. Competitive sports for prizes are not considered betting or gambling, and can be offered without a gambling licence. The same is ultimately true for skill competitions, but skill competitions often have an element of chance, for example, a drawing between correct answers in a quiz where more than one participant has the correct answer, but only one can be the winner, and consequently are close to the legal definition of combination games. However, if the questions are not simple to the extent that the average person would get everything right with little or no effort, such competitions are not considered to be gambling and therefore do not require a licence. Free prize draws are considered gambling as they fulfil the definition of a lottery under Danish law. However, since the element of a wager is not present in a free prize draw, a licence is not required to offer such draws legally, but a gambling duty on the prize must be paid by the operator. Article 2 Section 3 of the Danish Gambling Act excludes betting on the future value of financial instruments that lie outside the scope of the Gambling Act, and such betting, for example spread betting, is consequently regulated by the Financial Services Act. This does not exclude all betting on financial products, and it is generally considered inside the scope of the Gambling Act and legal under a betting licence to offer fantasy league-style games on publicly noted shares, bets on which share will perform best on a given trading day, etc. The structure of Danish gambling legislation is that the offering of gambling is generally prohibited unless the operator has a licence to offer gambling. On the offering of betting and online casino, there is no limitation to the number of licences that can be granted, and anyone who fulfils the legal requirements and satisfies the Danish Gambling Authority that the operation can be run responsibly and will be sufficiently funded will be granted a licence. The offering of lotteries as defined in the Gambling Act (except for games positively exempted as allowed casino games) is restricted to state-owned operators. Denmark has three different types of class lotteries, and Danske Spil A/S holds the monopoly to offer any other kind of lottery. All other types of gambling have been opened up to privately owned operators who have obtained a gambling licence. In Denmark, gambling is regulated and licensed nationally. With regards to Greenland and the Faroe Islands, the local governments have full jurisdiction and autonomous authority regarding regulated gambling. Currently, Greenland allows gambling on the same premises as offered in the Gambling Act and the Faroe Islands have continued with a complete ban. The key element with regards to offshore gambling is whether or not an offshore gambling operator is targeting the Danish market. Under the Gambling Authority’s current interpretation and enforcement of the Gambling Act, accepting wagers from players located in Denmark without having a Danish licence is not contrary to Danish law provided that the operator accepting such wagers is not targeting its offering of gambling products at the Danish market. h there is direct marketing targeting Danish consumers, where the operator sender is aware that the recipient is based in Denmark. If an operator targets the Danish market without a Danish licence, the Gambling Authority has shown great commitment to having such offering shut down. So far the Gambling Authority has had a great deal of success doing this, and in most cases cease-and-desist letters have proven sufficient. Article 65 of the Gambling Act provides the Gambling Authority with the legal authority to block payment services to an operator offering gambling in Denmark without a licence. The same provision allows the Gambling Authority to block access from Denmark to the violating operator’s website or websites. Further, Article 59 places a complete ban in Denmark on advertising of unlicensed gambling. In all cases where cease-and-desist letters have proven insufficient to stop the unlicensed offering, the Gambling Authority has successfully gained court orders to force internet service providers (ISPs) to prevent access to certain websites where unlicensed gambling was offered and targeted at the Danish market. For all the time that the Gambling Act has been in force (currently, more than five years), the Gambling Authority has not made use of its legal authority to block payment services. After an initial period with a substantial number of cease-and-desist letters and ISPs blocking access to websites, the letters and advertisement ban, combined with critical mass in terms of number of operators with a licence to offer gambling, seems to be sufficient to keep most unlicensed gambling out of the Danish market. The Gambling Authority estimates the unlicensed offering of gambling in Denmark to represent 5 per cent or less of the total Danish gambling market. The operators are less optimistic but still estimate that approximately 85 per cent of the Danish market is licensed and compliant. The Gambling Authority has not yet had to pursue enforcement, including fines for violation of the Gambling Act, outside Denmark, so the enforceability of the Gambling Act against a foreign operator has not yet been identified. The Gambling Authority is pursuing and developing cooperation with as many foreign gambling regulators and gambling commissions as it can, in order to improve its chances of receiving assistance if a foreign operator violates Danish law, and to promote a higher degree of uniformity and mutual recognition of standards within, in particular, the online gambling industry. The Gambling Act does not restrict the number of licences that can be granted in any way, and is therefore in compliance with EU law, at least in terms of the types of games that have been liberalised as a result of the law reform. The EU-wide enforcement of Danish law against a foreign EU-based entity can therefore not be excluded. However, regarding games that are still part of Danske Spil A/S’s monopoly, the legality of the Gambling Act from an EU law perspective is unclear. The government has given no justification for maintaining a state monopoly on the offering of, for example, bingo, scratch cards or horse race betting, and consequently the enforcement of this part of the legislation outside of Denmark is questionable at best. Danish gambling legislation was built around a complete prohibition of any kind of gambling activities, dating back to the 18th century. Over time, a series of acts were implemented introducing exceptions to the complete prohibition of gambling. The prohibition includes a ban on the provision of, the participation in and the promotion of gambling. On 4 June 2010, the new Gambling Act was passed unanimously in the Danish parliament, and the Act entered into force on 1 January 2012. Until then, the main exception to the general prohibition was the state-owned monopoly operator, the public limited liability company Danske Spil A/S, which was granted an exclusive licence to offer betting, lotteries and online gambling. The state monopoly governed both online and offline gambling, and from the administrative practice of the Danish tax authorities it could be concluded that, unless a game was expressly excluded from the licence through legislation, then Danske Spil A/S was licensed to provide the game. The new Gambling Act was intended to serve two purposes: to open the market for privately owned national and international betting and online casino operators; and to clean up the complex web of regulations, executive orders and unclear jurisdictional issues between local police, local government and national government regarding the offering of gambling. 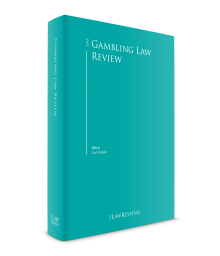 The Gambling Act can be characterised as framework legislation, and was drafted to be applicable in the future and to withstand the rapid technological development related to remote gambling in particular. One measure that makes this possible is that the relevant minister (currently the Minister of Taxation) has been granted the legal authoritative powers to issue specific regulation on certain areas. In this regard, these powers are granted to the Gambling Authority, which has now issued a number of executive orders on land-based betting, online betting, online casinos, land-based slot machines, land-based casinos and lotteries for the common good. Since the enactment of the Gambling Act, it has been the philosophy of the Gambling Authority to seek dialogue with all stakeholders, including players and operators, to develop the market for the mutual benefit of all stakeholders. As a result of this approach, any issues thus far have been resolved without involving the Danish courts, and consequently there is no case law available that has shaped the law or offered any interpretations of the law that differ from those enforced by the Gambling Authority. The Gambling Authority has published several guidelines of interpretation regarding various specific topics including sales promotions, advertisement for bonuses, anti-money laundering rules, etc., but although these guidelines specify the Gambling Authority’s interpretation of the gambling legislation, they are not law and do not express the view of the Danish courts. Ultimately, only the courts are competent to interpret Danish law with binding effect. With the law reform expressed by the enactment of the Gambling Act on 1 January 2012, all powers regarding the regulation of gambling in Denmark have been combined and the Gambling Authority now has sole jurisdiction of all regulatory and compliance matters related to gambling. Before the law reform, the Gambling Authority had the status of a department within the Danish Tax Administration (SKAT). With the reform, the Gambling Authority was detached from the administration and responsibility area of SKAT and converted into an independent authority with its own management and budgetary responsibilities. Danish gambling legislation differentiates between land-based casinos and online casinos. Land-based gambling is defined as games concluded by a player and a gambling operator, or the gambling operator’s dealer, meeting physically. Online gambling is, on the other hand, defined as games that are concluded between a player and a gambling operator using remote communications. While online gambling is not restricted as regards the number of possible licensed operators, there are restrictions regarding land-based gambling. The current regime allows for eight land-based casinos, and consideration to geographic location is given when granting a licence, thereby creating a sort of geographical competitive protection for land-based casinos. Similarly, the geographic location of slot machine halls and similar venues is considered when granting a licence. However, with regard to slot machine halls, there is no limit to the number of operational licences that can be granted, and consequently the geographic protection from competition is typically not available, and there is far less protection than is given to land-based casinos. Another major difference is the tax rate. While the land-based industry is taxed depending on the gross gambling revenue (GGR) achieved (between 40 per cent and 75 per cent), the online gambling duty is set at 20 per cent of GGR regardless of the size of the GGR. For a land-based operator, all personnel involved in the gambling operation must, as a main rule, be approved in writing by the Gambling Authority. Part of the approval proceeding is a thorough background check of the person in question. The approval is considered a personal licence as such, but resembles a premises licence in many ways. The primary venues for land-based gambling are casinos, slot machine halls and outlets for lottery games and betting. Secondary venues are poker tournaments organised by licensed poker associations or poker tournament organisers. There are currently eight onshore casino licences and two offshore casino licences available for ‘land-based’ casinos in Denmark. A land-based casino licence allows the operator to offer casino games. Although there is no exhaustive definition as to what constitutes a casino game, a casino licence allows the casino to offer baccarat, punto banco, blackjack, roulette and slot machines. Any other game, including poker, can only be offered by the land-based casino if an additional approval has been granted by the Gambling Authority to the casino. c the location must be approved by local police and the city council. Similar criteria are applied when considering an application for a licence to operate slot machines. Slot machines operated under a different licence than the land-based casino licence are allowed only smaller maximum wagers and smaller maximum prices than those slot machines operated inside the casino. With regard to outlets for lottery and betting (including betting shops), there are no defined geographical restrictions and, similar to slot machine halls, there are no limitations in numbers. The operation of the outlet requires that the person in charge be approved by the Gambling Authority, but the offering of the games themselves does not require an additional licence for a land-based outlet other than the licence granted for offering and operating the game in question. In other words, the offering of Danske Spil A/S’s scratch-card games does not require a licence to offer scratch-card games for a land-based outlet. The only licence required is Danske Spil A/S’s licence to offer the game. Operators holding a Danish online licence can offer remote gambling without restrictions as to media. In other words, gambling can be offered via the internet, mobile phones, tablets, television and any medium suitable for remote communication. However, under Danish law, a computer set up in a public place that can only access one particular online casino is considered to be a land-based casino offering and requires a land-based casino licence. Danish gambling legislation allows open liquidity and thereby allows Danish players to be active in games where players from other jurisdictions also play. This is particularly important with regards to poker and jackpot pools. A licence to offer online gambling only grants the operator a licence to offer gambling in Denmark. Taking wagers from non-Danish players is not covered by the Danish licence and the legality will, from a Danish legal point of view, depend entirely on the laws in the country from where the wager is placed. The main rule regarding servers under Danish law is that servers on which the gaming software and other operational software are run must be located in Denmark. The exceptions are if the servers are placed in a jurisdiction with which the Gambling Authority has a cooperation agreement in place; in such cases, the server and the equipment do not need to be in Denmark. Finally, as a last resort the Gambling Authority has the power to accept that a server can be placed in any jurisdiction in the world if the Authority is of the opinion that its power to enforce Danish law and secure compliance is not jeopardised by its physical location. The responsibility for compliance with Danish law is placed solely with the operator that holds the licence. The licensed operator is free to choose its suppliers, affiliates, white-label operators and other contracting partners. However, regardless of who is at fault, if a violation of the licence or the law occurs, the licensed operator is liable. Consequently, there is no licence granted to manufactures or software suppliers, as it is the licensed operator’s sole responsibility to secure 100 per cent compliance throughout the entire supply chain. Certification of technical standards and functionality, including business practices, must be completed by a testing lab that fulfils the requirements defined by the Gambling Authority. However, it is also the licensed operator’s responsibility to make sure that the chosen testing lab has the required skill and experience to conduct testing and certification in compliance with Danish law. An individual does not need a personal licence, but a licensed operator must be prepared at any given time to prove to the Gambling Authority that key individuals involved in technical set-up, finances, anti-money laundering, operation, etc., are sufficiently skilled and experienced to hold these positions. Particularly with regard to land-based gambling operations, all staff must be approved by the Gambling Authority. This approval is mainly a background check and cannot be compared with the due diligence check that is conducted on individuals in some jurisdictions. The phrase ‘gambling operators’ is commonly used as a collective term for natural persons and legal entities that provide gambling activities. As a rule, licences to provide and arrange gambling can be granted to natural persons and legal entities. An exception is made for licences for the provision and arrangement of local pool betting on local cycle racing on tracks, dog racing on a racecourse and pigeon racing, since such licences can only be granted to legal entities that are organisers of such types of racing and that are members of the relevant sport’s central organisation or association. Moreover a licence for local pool betting on horse racing can only be issued to associations that have held such a licence for a number of years, and licences to arrange charitable lotteries can only be granted to associations, institutions or committees composed of at least three persons. Since provision of lotteries, betting on horse and dog racing is still subject to a monopoly, a licence to provision hereof can only be granted to Danske Spil A/S. c do not have unpaid, outstanding debt to the public sector. In addition to the above requirements, a gambling licence may only be granted to natural persons above the age of 21 who are not under guardianship and for whom a surrogate decision maker has not been designated. If a natural person or a legal entity is resident or established outside Denmark or any Member State of the EU or the EEA, a licence can only be issued to the operator if it has appointed a representative who has been approved by the Gambling Authority. The representative can either be a natural person or a legal entity. The representative should be resident or established within Denmark and must fulfil the same requirements as the applicant itself. Moreover, the representative should be authorised to represent the operator in relation to the public authorities and in legal proceedings as well as criminal proceedings. Along with the licence application form, the applicant must provide documentation that the operator is sufficiently funded and is in possession of the skills and experience necessary to run a gambling operation professionally and compliantly. This documentation should be submitted in the form of annual accounts, budgets, business plans, CVs of key individuals, various policies and reports on compliance, corporate governance, security, anti-money laundering, licences in other jurisdictions, statements from accountants and possibly guarantees issued in favour of the applicant by third parties such as a bank or a mother company. Further, the applicant needs to submit documentation of the technical setup, including system security and integrity. Standard records should show that the required data vault in the Danish system, referred to as SAFE, is fully functional and compliant, and grants the Gambling Authority remote access to all relevant data on game and money transactions involving Danish players. The final part of the application material is the certification of the gambling system including game software, random number generator, report generators and the backend system including anti-money laundering surveillance, financial transaction systems, know-your-customer procedures and storage of personal information. The processing of an application typically takes from three to six months for the Gambling Authority, but in most cases the processing time is closer to three months than six months. c income limited licence – 53,500 kroner. Both the betting and the online casino licences are limited to five years, and in addition to the application fee and the gambling duty a licensee must pay an annual licence fee, which is calculated on the basis of the realised GGR. With effect from 1 July 2016 the annual license fees were changed. The reason behind the change was to reduce the annual fee for small and medium-sized operators and to increase the fee for the largest operators. In addition, more GGR intervals were added. The annual fee in 2017 varies from 53,500 kroner to 4,815,000 kroner. Since the first licences were issued on 1 January 2012, none of the existing licences have been renewed under the Gambling Act. The renewal fee for an application of renewal of an existing licence is 133,800 kroner. It was originally announced by the Gambling Authority that due diligence connected with the reapplication was going to be considerably reduced compare to that of a new applicant. However, for an operator the difference is difficult to identify at least in regards to the financial and corporate due diligence. Because of the technical change management system of the Gambling Authority and the regular reporting requirements on technical issues the reapplication process is almost entirely focused on financial and corporate matters. The reapplication procedure takes approximately three months. The most common sanction for violation of Danish gambling law is a fine. A fine is always determined on the basis of the facts of each individual case, but is usually not settled at less than 10,000 kroner. The fine for violation of Danish law regarding unsolicited direct marketing using remote communication media is 100 kroner per message sent, but no less than 10,000 kroner. In other words, if a marketing email is sent to 10,000 individuals who have not given their consent to receive such marketing material, the fine will be at least 1 million kroner. In severe cases, the sanction for offering unlicensed gambling can be set at up to one year of imprisonment. For licensed operators that operate in violation of either their licence or the gambling law, change of licence conditions, suspension and revocation of the licence are sanctions that the Gambling Authority can use to enforce gambling law, and compliance with legislation and regulation. For payment service providers and ISPs, criminal liability only comes into play if the provider in question disobeys, disregard or ignores a court order to block payments to or from an operator, or if access is granted to the operator’s website despite a court order to block it. For advertisers, the same sanctions apply as those applicable to operators who offer gambling without a licence. A licensed operator has an obligation to have the necessary anti-money laundering proceedings in place, including conducting a source of funds investigation, politically exposed person checks, suspicious activity reporting, etc. It is the operator’s responsibility to ensure that such measures and proceedings are working and that they are sufficient to comply with applicable legislation and regulations. Operators are obliged to report suspicious activity to the district attorney for special financial and international crime. Further, betting operators have an obligation to have necessary and sufficient measures in place to identify and combat match-fixing. The Danish gambling duty is calculated on the basis of GGR, which is defined as wagers minus winnings. For betting and online casinos, the gambling duty is 20 per cent of GGR. Regarding peer-to-peer games such as poker and betting exchanges, the calculation base of the gambling duty is the commission charged by the operator to facilitate the game. For land-based betting, the rate of the gambling duty depends on the realised GGR in a certain period, and it varies from 45 per cent to 75 per cent of GGR. The gambling duty on prizes awarded in prize draws and games without wagers is 15 per cent of the prize exceeding 200 kroner for cash prizes and 17.5 per cent of the value (market value) exceeding 200 kroner for non-cash prizes. Winnings from licensed gambling are tax-free for the player, but winnings from non-licensed gambling are personal income and are taxed as such with tax rates of up to 62 per cent. Gambling is exempt from VAT in Denmark, which also means that a Denmark-based operator cannot deduct VAT expenses when purchasing goods and services. With regard to corporate taxes, the gambling duty is seen as a tax-deductible business expense, which can be deduced in the operator’s corporate taxes. As a rule, marketing of licensed games is accepted under Danish gambling legislation. However, the licensee must take necessary measures to ensure that sales promotion is not sent to players who have excluded themselves from participation in gaming temporarily or permanently. Furthermore, Danish legislation prohibits offering and marketing to persons under the age of 18. There are only a few exceptions in this regard. The first exemption to this rule is charity lotteries where the age restriction does not apply. The second exception is the offering of land-based lotteries by Danske Spil A/S and class lotteries, which can be marketed and offered to everybody above the age of 16. The licence holder must ensure that all relevant information of the games offered under the licence is easily accessible to the players and the Gambling Authority. Furthermore, the marketing for gambling has to give a realistic impression of the chances of winning, and cannot display those chances as being greater than they actually are. Celebrities can only be used in the marketing for gambling operations if the message of the marketing campaign or advertisement does not portrait the celebrity as being successful because of gambling, unless this is actually the case. Finally, games offered under a licence must be described as amusement activities and the marketing cannot describe gambling as a way to solve economic problems or a way to gain social status. Marketing of unlicensed gambling is prohibited and sanctioned with fines and imprisonment for up to one year. For those that advertise for unlicensed gambling, the sanction is a fine. The Gambling Authority has launched a new service that will allow Danish residents to opt out of all gambling-related direct advertisement with one registration. The new database will be run parallel to the register of self-excluded persons, and operators are encouraged to cross reference their mailing lists immediately before sending out marketing material. There are still some important potential issues with this service in terms of personal data protection and timing, and it is unclear if the Gambling Authority has legal authority to make the use of this service mandatory. The period of the end of 2016 and beginning of 2017 was the first time that the existing operators in the Danish market had to renew their licences. There was some confusion as to the extent of the documentation requirements and due diligence scope for renewal applications. The reapplication fee and communication from the Gambling Authority suggested that the reapplication process would be reduced in scope and detail. However, now that most Danish licence holders have been through this process it seems that finding noticeable differences in the scope of the due diligence and the documentation requirements between a new application and an application for the renewal of an existing licence is very difficult indeed. Owing to the regular reporting and the change management programme, the technical issues when applying to renew a licence are close to non-existent, but therein lies the only difference between the application for a new licence and the application for renewal of an existing licence. The change from weekly to monthly reporting, calculation and payment of gambling duty seems to have eliminated most of the problem with de facto gambling duty in excess of 20 per cent, which means the change of law has proven itself to be a good and welcome improvement for the operators. The year 2016 was the fifth consecutive year with considerable growth in GGR on the open gambling markets, thus underlining the perception that the new Danish gambling legislation is working well, and that business is growing and is generally positive for licensed operators in Denmark. The ongoing considerations regarding a possible sale of Danske Spil A/S to private operators have quietened considerably. However, currently the Danish parliament is working on an additional opening of the Danish markets. Consequently it is expected that online bingo and horse race betting will be added to the list of games that can be offered under an online casino licence or a betting licence. This will make the Danish market more interesting for a number of operators and hopefully result in more licensed operators in the Danish market, making it even more difficult for unlicensed operators to attract business outside of Denmark. 1 Henrik Norsk Hoffmann is the founding attorney of Nordic Gambling ApS.